Even though the battle between the two formats that want to follow up DVD, naming Blu-ray and HD-DVD, is still going on, doesn't mean that the DVD is already kicked out of the market. This is, if designers such as Yeon-shin Seung keep on making concepts like this one. 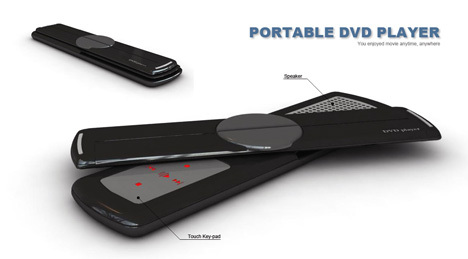 Here's the coolest PDP (portable DVD player) concept that I've ever seen. 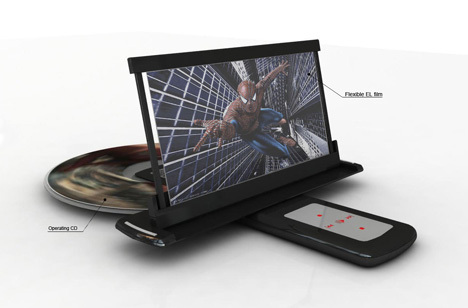 The plan is to use the Sony full color flexible organic electroluminescent display as a flexible, thin and lightweight screen. This screen makes use of OLED technology. A while ago I posted the coolest MP3 player and this DVD player uses the same technique of an external disk loader. It's just a concept and I don't know if it's coming to the market soon or not, but what the heck, just like the MP3 player, it just looks so awsome! Did you like this article? Subscribe to my feed or email to keep updated on new articles. This (we)blog brings you information about (web)design, blogging tips, (programming) tutorials and much, much more. I can't describe Marcofolio.net in words: Just look around and be amazed. Many (new) visitors have a habit to stick around, just because of the variety of articles. Have fun reading this blog and don't forget to subscribe to the feed to keep updated on the latest articles.